When we were away for the weekend last month without access to our usual cable shows, we watched Tom Clancy's Jack Ryan on Amazon Prime on my laptop - by the time we got back home a few days later, we were hooked on this new TV series that feels like a movie. 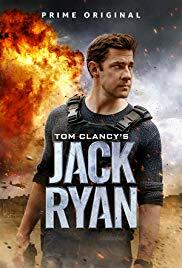 John Krasinski (who played Jim on The Office) is the latest in a long series of actors to play Jack Ryan, a recurring character who appeared in many of Tom Clancy's thriller novels. As in the novels, Ryan is a mild-mannered analyst in the CIA, toiling away in his cubicle and analyzing various events and activities overseas. In the first episode of this new series, Ryan picks up on a pattern of communications and money transfers among suspected terrorists in the Middle East. It takes him a while to convince the higher-ups that the threat is real, but eventually he gets through to his new boss, James Greer (played by Wendell Pierce, a favorite of ours from Treme and The Wire), who has made some mistakes in his career and is supposed to be laying low in his new position. The two are sent overseas, where Ryan suddenly finds himself in the middle of the violence of the terrorists instead of behind a desk. The complex plot and the tension build, as the CIA tries to close in on a new terrorist leader, chasing him and his men all over Europe and the Middle East. If you liked any of the previous movies based on Clancy novels and featuring Jack Ryan, then you will love this new series because it really has the feel of a movie. It is action-packed and fast-paced, with lots of suspense and a twisty plot. There is also a romance angle, as Ryan begins dating someone new but must keep his real job - and his increasingly dangerous assignments - secret from her. We thought Krasinski did a great job in the role. Obviously, with a thriller plot about terrorists, there is plenty of violence here, some of it graphic, with ample gunfire and explosions, but the show is filled with excitement and tension that keeps you watching (and perhaps even binging) to see what happens next. We enjoyed it very much. The first 8-episode season is available exclusively on Amazon Prime, and a second season is in the works for 2019 - we'll definitely be watching it! I've never read the books or watched it but your statement "TV series that feels like a movie" sure grabbed my attention. I'll check it out. Very movie-like feel to this series, Vicki - hope you like it! I saw previews and thought I'd like to watch this show. Thank you for the reminder! Hope you enjoy it, Helen!